Background: Processes of Alzheimer disease (AD) likely begin years prior to the onset of cognitive impairment (latent AD), progress though a prodromal phase of mild cognitive impairment (MCI), and culminate in dementia. While many studies have evaluated CSF tau and Aβ42 as biomarkers of the dementia or prodromal stages of AD, we are unaware of any study to evaluate these potential CSF biomarkers of latent AD. Methods: We determined the ratio of CSF tau/Aβ42 (T/Aβ) using Luminex reagents in 129 control individuals that spanned from 21 to 100 years of age; for comparison we included patients with MCI (n = 12), probable AD (n = 21), or other neurodegenerative diseases (n = 12). Results: We identified 16% of the control group with abnormally elevated CSF T/Aβ; all were 53 years or older. Using age-matched controls with normal CSF T/Aβ we showed that the high CSF T/Aβ subgroup of controls had significantly increased frequency of the ε4 allele of the apolipoprotein E gene and significantly increased risk of conversion to MCI during follow-up of up to 42 months suggesting that they had latent AD at the time of lumbar puncture. Conclusions: These generally applicable methods establish cutoff values to identify control individuals at increased risk of conversion to mild cognitive impairment which may be useful to people weighing the risk-benefit ratio of new preventive therapeutics and to researchers striving to enrich clinical trial populations with people with latent Alzheimer disease. It is becoming clear that the processes of Alzheimer disease (AD) likely begin years, if not decades, prior to the onset of cognitive impairment (latent AD), progress though a prodromal phase with some demonstrable cognitive impairments, and culminate in dementia. The search for surrogate indices of latent AD is pressing because developing therapeutic strategies likely will soon require identification of cognitively intact individuals with latent AD who will have a different risk-to-benefit ratio than individuals without latent AD. The size and scope of studies that have evaluated CSF Aβ42 and tau as biomarkers of latent AD have been limited. Asymptomatic carriers of presenilin or APP mutations that cause rare forms of autosomal dominantly inherited AD had lower CSF Aβ42 levels than age-comparable controls.7 As pointed out repeatedly at the recent 10th International Alzheimer's Association meeting, we currently lack basic information on standardized reagents and cutoff values for these CSF biomarkers of latent AD. Here we have undertaken to determine robust cutoff values for the ratio of CSF T/Aβ for the transition from latent to prodromal AD. Human Subject Divisions at Oregon Health & Science University (OHSU) and the University of Washington (UW) approved this study. CSF was obtained by lumbar puncture at both institutions by the same method.8 Briefly, following written informed consent, individuals were placed in the lateral decubitus position and the L4-5 interspace was infiltrated with 1% lidocaine. Lumbar puncture was performed with a 20 g or 24 g spinal needle following which individuals remained at bed rest for 1 hour. All lumbar punctures were performed in the morning to limit potential circadian fluctuation in CSF protein concentrations. Following informed consent, all individuals underwent evaluation that consisted of medical history, physical and neurologic examinations, laboratory tests, and neuropsychological assessment. Family history of dementia was obtained from normal subjects or from informants for patients with MCI or AD, but was not used to determine eligibility. Laboratory evaluations included complete blood count, serum electrolytes, blood urea nitrogen, creatinine, glucose, vitamin B12, and thyroid stimulating hormone; all results were within normal limits for samples included in this study. Exclusion criteria for all groups included heavy cigarette smoking (more than 10 packs/year) and alcohol use other than social. Any psychotherapeutic use was an exclusion criterion for —controls while any psychotherapeutic use other than for treatment of neurodegenerative disease was an exclusion criterion for patient groups. Controls were compensated community volunteers in good health with no signs or symptoms suggesting cognitive decline or neurologic disease. We analyzed all control samples that met these criteria that were obtained at UW between December 2001 and November 2005. In addition, we analyzed all MCI samples from UW obtained during that same period as diagnosed by established protocol (vida infra). Finally, samples from patients with probable AD (vida infra) that were obtained during the same period and that met criteria were randomly selected from OHSU and UW CSF banks. All samples obtained from patients diagnosed with Parkinson disease or frontotemporal dementia obtained at both institutions during the same period and that met criteria were included; these two groups of patients were combined into another neurodegenerative disease group. No individual whose CSF was investigated in this study has come to autopsy at this time. Clinical evaluations and APOE genotyping. All CSF for analysis was taken from the 15th to 25th mL collected, was stored in 0.5 mL aliquots at −80 °C, and was never thawed prior to this study. CSF was analyzed for Aβ42, tau, and tau phosphorylated at amino acid position 181 (tau-P181) using Luminex reagents from Biosource Division of Invitrogen (Camarillo, CA) and X-MAP technology, the LiquiChip Workstation from Qiagen (Valencia, CA), exactly according to manufacturer's instructions. Standard curves were constructed from authentic standards included with each kit: 7 to 5,000 pg/mL for Aβ42, 7 to 5,000 pg/mL for tau, and 40 to 30,000 pg/mL for tau-P181. The lower limit of quantification was 40 pg/mL for Aβ42, 20 pg/mL for tau, and 80 pg/mL for tau-P181. Each CSF sample was analyzed in duplicate for each of the three endpoints and these then averaged for further statistical analyses using GraphPad Prism (San Diego, CA). The coefficient of variance for each assay was 4.3%, 2.3%, and 7.5% for Aβ42, tau, and tau-P181. There was no significant correlation between time frozen and any of these endpoints for the CSF obtained over this 4-year period. Characteristics of individuals whose CSF was used in this study are presented in table 1. Data on control individuals (n = 129), the focus of this study, were stratified into those <60 years (n = 81) and those ≥60 years (n = 48) because this will be an important distinction in subsequent analyses. A smaller number of patients with MCI, AD, or other neurodegenerative diseases (Other) were included for reference to previous studies. Consistent with our previous report of safety in 428 consecutive research lumbar puncture (LP),8 clinically significant adverse events were uncommon (<4%) and typical post LP headache was rare (<1%). No individual required fluoroscopy in this study. All variables were analyzed by nonparametric analysis of variance followed by corrected repeat paired comparisons to controls ≥60 years. Of course, given our stratification, age was significantly different in controls <60 years but not in any of the groups with clinically diagnosed disease. Contamination of CSF with blood as determined by the density of red blood cells (RBCs) was low and not different among the five groups. While we have excluded CSF samples with any detectable contamination by blood in our previous proteomic discovery projects,16–18 we retained all samples here because they more realistically reflect the types of samples obtained in clinics. The dual changes in CSF Aβ42 and tau were combined into a single metric of tau/Aβ42 (T/Αβ) as previously used by several other groups and then plotted vs age for controls, individuals with MCI, and patients with AD (figure 1). If attention is confined to the usual comparison of age-matched controls (≥60 years) vs MCI or AD, then we observed substantial overlap in CSF T/Αβ among these three age-matched groups that has been reported in virtually every study to date; similar overlapping results were obtained among these age-matched groups when CSF tau-P181/Aβ42 was used (not shown). Importantly, the distribution of CSF T/Αβ in younger controls was much narrower than in controls ≥60 years, suggesting relatively tightly regulated CSF levels of these two proteins in all younger control individuals and some, but not all, older control individuals. This clear distinction in the age-dependent dispersion for CSF T/Aβ in controls was not nearly as apparent when CSF Aβ42, tau, tau-P181, or tau-P181/Aβ42 alone was plotted against age (not shown) and so we did not pursue these further. 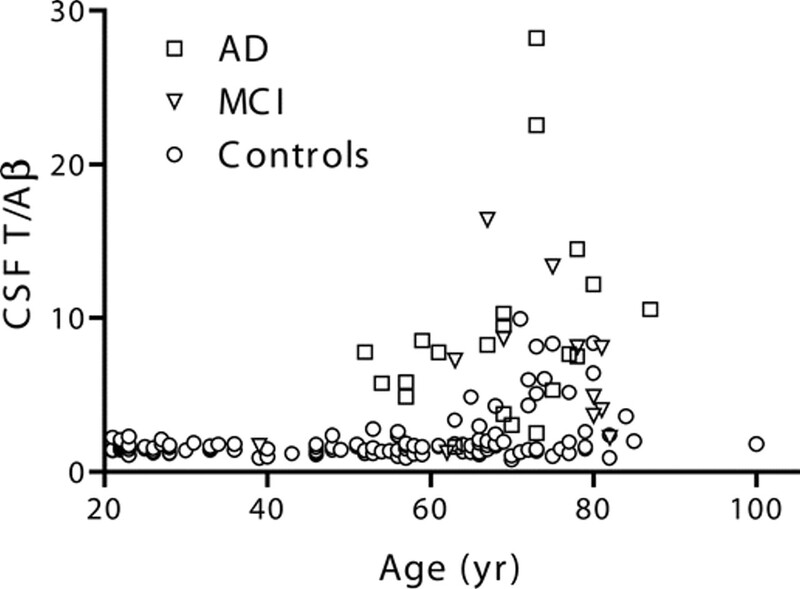 Scatter plot of CSF T/Aβ levels for controls and all individuals with a clinical diagnosis of mild cognitive impairment (MCI) or Alzheimer disease (AD). We hypothesize that some of the control individuals with elevated CSF T/Αβ have latent AD. We sought to define this group based on CSF T/Αβ independent of the confounding effects of age. In order to do this we needed to define a normal value for CSF T/Αβ. We attempted to achieve this by assuming that control individuals <60 years of age would be unlikely to have latent AD. We admit that this is an arbitrary cutoff but it is one that has been used widely in the field and is supported by the scatterplot in figure 1. The frequency distributions for controls <60 years and controls ≥60 years are presented in figure 2. The frequency distribution for CSF T/Αβ for controls <60 years formed a Gaussian distribution (KS distance had p > 0.01) with a mean of 1.6 and SD equal to 0.4. 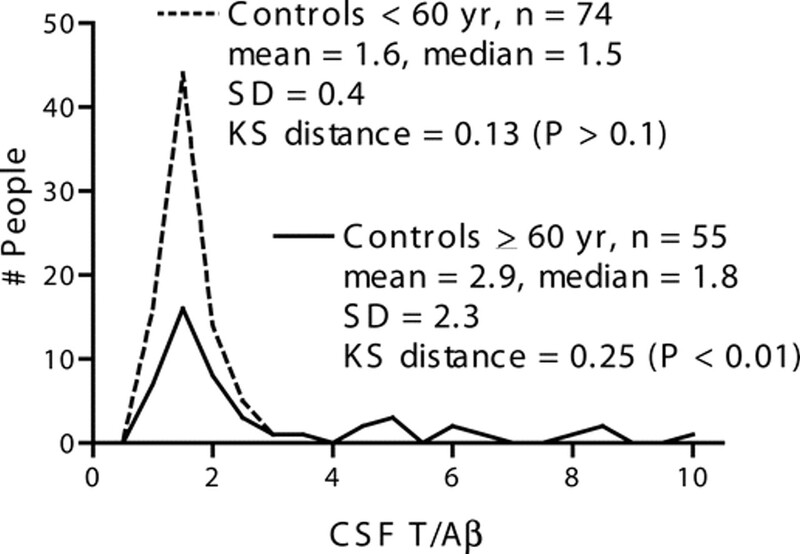 Identical analysis of controls ≥60 years showed that the majority of this group also normally distributed around 1.6; however, a significant subset of controls ≥60 had CSF T/Αβ skewed to higher values (KS distance had p < 0.01). Therefore, we stratified controls into a normal subgroup defined as those with CSF T/Αβ that was <2.4 (mean + 2 SD of control ≤60 year group) and a high subgroup defined as those with CSF T/Αβ ≥2.4. Frequency distribution of CSF T/Aβ levels for all control individuals dichotomized into < or ≥60 years of age. Table 2 presents the characteristics of controls stratified into normal or high CSF T/Αβ subgroups. A few points need to be stressed. First, 21 of the 129 controls (12%) were defined as high CSF T/Αβ by this cutoff value. Second, as expected, the high CSF T/Αβ subgroup was significantly older on average than the normal high CSF T/Αβ subgroup; however, the oldest person in our study was 100 years old and was a member of the normal subgroup. Finally, APOE allele frequency was significantly different between these two subgroups of controls defined by CSF T/Αβ with the high CSF T/Αβ subgroup having relatively lower APOE ε3 and higher APOE ε4 frequencies. We next examined the distribution of CSF T/Αβ among our five groups with the controls now stratified into normal or high CSF T/Αβ (figure 3). While it is trivial that the normal and high CSF T/Αβ subgroups were significantly different, it is important that the normal subgroup was significantly different from both MCI and AD groups, and it was especially important that the high CSF T/Αβ subgroup was not different from either the MCI or AD groups. In combination, these data suggest that by using a simple definition of normality that derived from obtaining data across the adult human lifespan, we were capable of identifying a subset of control individuals whose CSF T/Αβ was similar to people with MCI or patients with AD. Kruskal-Wallis test showed p < 0.0001 for all five groups: normal CSF T/Aβ subgroup of controls, high CSF T/Aβ subgroup of controls, mild cognitive impairment (MCI), Alzheimer disease (AD), and other neurodegenerative diseases. Dunns-corrected repeat paired comparisons with p < 0.05 are shown for all comparisons except for other, which had p < 0.001 when paired with high, MCI, or AD but p > 0.05 when paired with normal. We next sought to determine if our stratification based on CSF T/Αβ had any value in discerning those control individuals who had poorer performance on cognitive tests at the time of lumbar puncture, increased genetic risk for AD, or increased conversion to MCI in the ensuing years. Since age was significantly different between these two subgroups of controls, we used all members of the high CSF T/Αβ subgroup (aged 53 years and older; n = 21; 20 were white and 1 was Asian/Pacific Islander) but only those from the normal CSF T/Αβ subgroup who were 53 years or older at the time of lumbar puncture (n = 51; 46 were white, 3 were Asian/Pacific Islander, 1 was American Indian, and 1 was African American). Table 3 presents a summary of results from these two age-matched control subgroups. Our data showed that CSF tau was significantly higher, CSF Aβ42 was significantly lower, and CSF tau-P181 was no different between these two groups, indicating that separation of these control individuals was based on changes in both CSF tau and Aβ42. Despite these differences in CSF protein concentrations, our data showed no significant difference in the psychometric test performance by the normal and high CSF T/Αβ subgroups at the time of lumbar puncture. Given the effects of APOE on several diseases that affect longevity, we further evaluated APOE allele frequency in the high CSF T/Αβ subgroup and the subset of individuals in the normal CSF T/Αβ subgroup who were 53 years or older at the time of lumbar puncture (figure 4). These data showed a statistically significant shift in APOE allele frequency between these two age-matched control subgroups with the high CSF T/Αβ subgroup having more frequent APOE ε4 and less frequent APOE ε3. Analysis of APOE allele frequency in controls within the high CSF T/Αβ subgroup (n = 21, ≥53 years old) and the 51 controls in the normal CSF T/Αβ subgroup who were 53 years or older at time of lumbar puncture. χ2 test had p < 0.01. These data for APOE allele frequency can be interpreted as suggesting that the high CSF T/Αβ subgroup of controls is at increased risk for subsequently developing MCI and then AD. We tested this by performing survival analysis for time to conversion to MCI in these two subgroups (figure 5A). It is important to note our clinical core invites for follow-up those control individuals who are 65 years or older; therefore, 37 of 51 (73%) people in the normal CSF T/Αβ subgroup and 17 of 21 (81%) people in the high CSF T/Αβ subgroup were eligible for follow-up (χ2 p > 0.05). Of these, 26 individuals in the normal CSF T/Αβ subgroup returned for follow-up while all 17 eligible members of the high CSF T/Αβ subgroup returned for follow-up. During the up to approximately 3.5 years of follow-up in each subgroup, all four conversions to MCI occurred in controls who were in the high CSF T/Αβ subgroup (p < 0.05). The APOE for these four converters to MCI were ε4/ε4, ε3/ε4, ε3/ε3, andε2/ε3. Figure 5B is a plot of CSF tau vs Aβ42 for control individuals who were 53 years or older and who had normal CSF T/Aβ (n = 51) and who had high CSF T/Αβ (n = 21) where filled symbols mark the four individuals who subsequently converted to MCI. 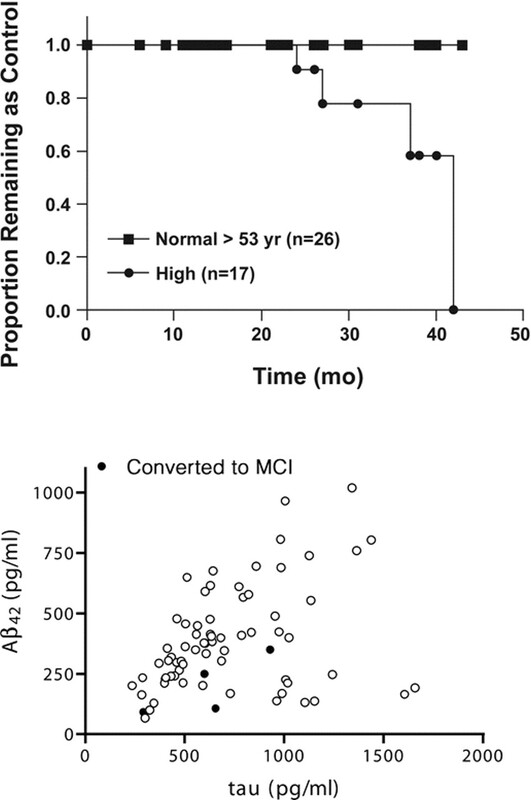 Although limited to data from only four people, these results suggest that the elevated CSF T/Aβ in those who converted to MCI was driven more by low CSF Aβ42 than by elevated tau. (A) All control individuals 65 years or older were invited for follow-up clinical evaluations: 37 in the normal CSF T/Αβ subgroup and 17 in the high CSF T/Αβ subgroup. Survival analysis with the endpoint of conversion to MCI was performed on all control individuals with follow-up information (n = 26 in the normal subgroup and 17 in the high subgroup). Median time to conversion to MCI in the high CSF T/Αβ subgroup was 42 months while no conversions occurred in the normal CSF T/Αβ subgroup. Logrank test for comparison of survival curves had p < 0.05. (B) Plot of CSF tau vs Aβ42 for control individuals who were 53 years or older and who had normal CSF T/Aβ (n = 51) and who had high CSF T/Aβ (n = 21) where filled symbols mark the four individuals who subsequently converted to MCI. As early as 1976, Katzman applied a chronic disease model to AD and proposed the existence of a latent stage where some structural damage accrues but there are no functional or behavioral changes, followed by a prodromal stage during which more structural damage accrues and mild functional and behavioral changes occur, and ultimately by a clinical stage with substantial irreversible damage and behavioral abnormalities.23 Such a model likely does not reflect the full complexity of AD processes, for example, community-based clinicopathologic studies and more recent PET imaging studies have shown that some cognitively intact individuals have high levels of AD-type pathologic changes. While such cases are intensely interesting and undoubtedly hold important clues to the pathogenesis of dementia in the elderly, clinical, imaging, and pathologic data support that AD commonly progresses over such stages as proposed by Katzman and that these stages almost certainly form a continuum that begins years prior to clinical diagnosis of dementia that then lasts about another decade. Several studies have reported on diagnostic performance of CSF total tau, phosphorylated forms of tau, or Aβ42 in patients in the dementia phase of AD.2 Most but not all of these studies24 observed sensitivity and specificity for a combination of Aβ42 and tau biomarkers to be higher than either marker alone, likely because of limitations to interpreting either single biomarker. Indeed, recent PET imaging with tracers for amyloid suggest that some older individuals may have a benign cerebral Aβ amyloidosis that is perhaps related to APOE, while several studies have shown that elevated CSF tau is related to neuronal damage but not specifically AD, although some phosphorylated forms of tau may increase specificity for AD.6,25–31 More recently, investigators have focused on the transition from prodromal to dementia phases of AD, where several groups have highlighted a similar role for CSF total tau, tau-P's, and Aβ42 in predicting progression from prodromal to dementia stages of AD.32–35 We are unaware of any previous study to evaluate these CSF biomarkers at the latency stage of AD. Since AD is so common in older individuals, a critical corollary to the idea that AD progresses from latent to prodromal to dementia stages is that a substantial subset of age-matched control individuals who are commonly employed in biomarker studies will in fact have latent AD. Indeed, the partial overlap between AD and age-matched control groups in virtually every CSF biomarker study can be interpreted as supporting this contention. Although there are obviously important age-related processes occurring that can be reflected in CSF proteins and metabolites,15 here we have tried deliberately to remove the confounding effects of age and focus rather on the presence of disease state regardless of age. We did this by defining as reference younger individuals who we hypothesize are much less likely to have latent AD. Using this approach, we established a normal range for CSF T/Aβ that was applicable across the human lifespan; indeed, the oldest individual in our study was 100 years old and had normal CSF T/Aβ. This approach allowed us to remove age from our analyses and rather concentrate on those with normal vs abnormally elevated CSF T/Aβ. We attempted similar analysis with CSF Aβ42, tau, tau-P181, or tau-P181/Aβ42; however, their relationship to age was not nearly as clear as CSF T/Aβ in our control group and thereby limited our ability to define a normal range with confidence. The high CSF T/Αβ subgroup was 21 of the 72 control individuals who were 53 years or older. Importantly, the high CSF T/Αβ subgroup had significantly increased CSF tau, significantly decreased Aβ42, and was significantly over-represented for the APOE ε4 allele, a genetic risk factor for late onset AD, indicating that this subgroup is at greater risk for subsequently developing AD than the normal CSF T/Αβ subgroup. Moreover, the high CSF T/Αβ subgroup had CSF T/Aβ levels that were indistinguishable from the MCI or AD groups; one interpretation of these data are that processes of AD have already started in a substantial number of people in the high CSF T/Αβ subgroup. Despite the increased frequency of APOE ε4 and abnormally elevated CSF T/Aβ, this subgroup was indistinguishable from the normal subgroup on a battery of cognitive tests. In combination, these data led us to propose that the high CSF T/Αβ subgroup contained a larger number of people with latent processes of AD than did the normal CSF T/Αβ subgroup. Whether these latent processes of AD will ultimately manifest as dementia from AD or an often closely related illness, dementia with Lewy bodies, currently awaits classification from analysis of autopsy material. CSF samples used in this study had been collected up to 3.5 years prior to analysis. During that time, control individuals who were 65 years or older had been invited to return for clinical follow-up. We returned to the clinical records of the control individuals who had clinical follow-up information and determined who had progressed to MCI or dementia. Survival analysis with conversion to MCI as endpoint showed that a significantly greater proportion of individuals in the high CSF T/Αβ subgroup converted to MCI over this period than age-matched control individuals in the normal CSF T/Aβ subgroup; indeed, all MCI converters were in the high CSF T/Αβ subgroup. 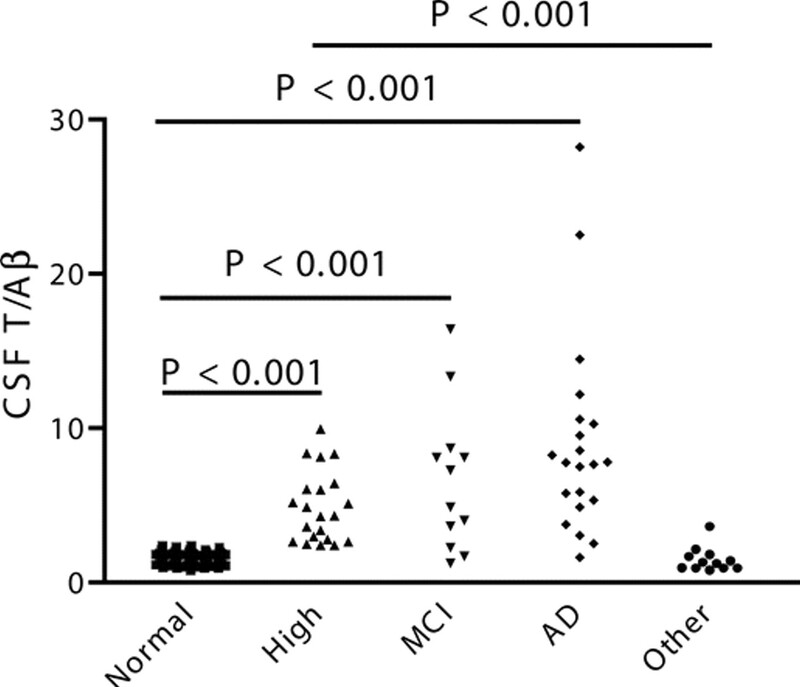 A plot of CSF tau vs Aβ42 for these older control individuals suggested that elevated CSF T/Aβ in the people who converted to MCI derived more from reduced Aβ42 than increased tau, a finding at least consistent with the amyloid hypothesis for AD and consistent with recent pathology studies. No person in the follow-up cohort developed dementia during this period. In combination with the data on APOE ε4 allele frequency and similarity of CSF T/Aβ levels with MCI and AD groups, these clinical follow-up data indicate that CSF T/Aβ perhaps may be used to identify a subgroup of older control individuals that is enriched with those who have latent AD. Since our cutoff value for CSF T/Aβ was highly correlated with inheritance of APOE ε4, it is worth considering if this test of CSF proteins provides any added information in addition to simply determining APOE genotype. Although a larger sample will be required to answer this question definitively, these two tests did not give the same information. Indeed, 48% of individuals in the high CSF T/Aβ subgroup did not inherit an APOE ε4 allele and, as importantly, 25% of individuals in the normal CSF T/Aβ subgroup ≥53 years did inherit an APOE ε4 allele. Key aspects of any generally useful laboratory test will be its safety and reproducibility across centers and clinics. Here we have employed a protocol for obtaining lumbar CSF that is demonstrably safe with minimal pain or discomfort, even to elderly patients with AD and when applied across multiple sites.8 Moreover, we have used commercially available reagents with a Luminex platform that is widely available in clinical laboratories. Using these standardized protocols, we have defined a cutoff value for CSF T/Aβ that defined a subset of cognitively normal individuals who were more likely to carry an APOE ε4 allele and who were more likely to convert to MCI over the next few years. These data suggest that this laboratory test can be used to identify cognitively normal adults at increased risk for developing MCI, although definitive demonstration will require further follow-up since the number of individuals who converted to MCI in our study is small. Another approach underway is to evaluate members of the high CSF T/Aβ subgroup with neuroimaging studies. Such a laboratory test may be useful to physicians and their patients as well as to researchers attempting to assemble cohorts in which to test therapeutics designed at suppressing processes of AD at its earliest stages. Supported by grants from the NIH: AG05136 and AG08017. Disclosure: Dr. Brodey is an employee of Biosource Division of Invitrogen. None of the other authors has reported conflicts of interest. Received September 29, 2006. Accepted in final form March 14, 2007. Sunderland T, Linker G, Mirza N, et al. Decreased beta-amyloid 1-42 and increased tau levels in cerebrospinal fluid of patients with Alzheimer disease. JAMA 2003;289:2094–2103. Blennow K. Cerebrospinal fluid protein biomarkers for Alzheimer's disease. NeuroRx 2004;1:213–225. Galasko D, Chang L, Motter R, et al. 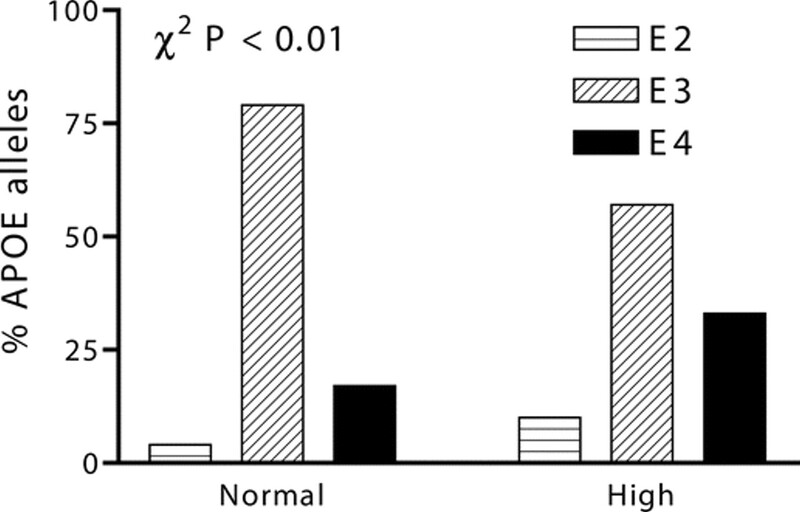 High cerebrospinal fluid tau and low amyloid beta42 levels in the clinical diagnosis of Alzheimer's disease and relation to apolipoprotein E genotype. Arch Neurol 1998;55:937–945. Hulstaert F, Blennow K, Ivanoiu A, et al. Improved discrimination of AD patients using β-amyloid1-42 and tau levels in CSF. Neurology 1999;52:1555–1562. Blennow K, Vanmechelen E. CSF markers for pathogenic processes in Alzheimer's disease: diagnostic implications and use in clinical neurochemistry. Brain Res Bull 2003;61:235–242. Hampel H, Teipel SJ, Fuchsberger T, et al. Value of CSF β-amyloid1-42 and tau as predictors of Alzheimer's disease in patients with mild cognitive impairment. Mol Psychiatry 2004;9:705–710. Moonis M, Swearer JM, Dayaw MP, et al. Familial Alzheimer disease: decreases in CSF Aβ42 levels precede cognitive decline. Neurology 2005;65:323–325. Peskind ER, Riekse R, Quinn JF, et al. Safety and acceptability of the research lumbar puncture. Alzheimer Dis Assoc Disord 2005;19:220–225. Folstein MF, Folstein SE, McHugh PR. “Mini-mental state”. A practical method for grading the cognitive state of patients for the clinician. J Psychiatr Res 1975;12:189–198. Wechsler W. Wechsler memory scale: revised. San Antonio, TX: The Psychological Corporation, 1987. Craft S, Newcomer J, Kanne S, et al. Memory improvement following induced hyperinsulinemia in Alzheimer's disease. Neurobiol Aging 1996;17:123–130. Reitan RM, Wolfson D. The Halstead-Reitan neuropsychological test battery. In: Wedding D, ed. The neuropsychology handbook: behavioral and clinical perspectives. New York: Springer Publishing Co., 1986:134–160. Petersen RC, Smith GE, Waring SC, Ivnik RJ, Tangalos EG, Kokmen E. Mild cognitive impairment: clinical characterization and outcome. Arch Neurol 1999;56:303–308. McKhann G, Drachman D, Folstein M, Katzman R, Price D, Stadlan EM. Clinical diagnosis of Alzheimer's disease: report of the NINCDS-ADRDA Work Group under the auspices of the Department of Health and Human Services Task Force on Alzheimer's Disease. Neurology 1984;34:939–344. Peskind ER, Li G, Shofer J, et al. Age and apolipoprotein ε4 allele effects on cerebrospinal fluid β-amyloid42 in adults with normal cognition. Arch Neurol 2006;63:936–939. Zhang J, Goodlett DR, Peskind ER, et al. Quantitative proteomic analysis of age-related changes in human cerebrospinal fluid. Neurobiol Aging 2005;26:207–227. Zhang J, Goodlett DR, Quinn JF, et al. Quantitative proteomics of cerebrospinal fluid from patients with Alzheimer disease. J Alzheimer Dis 2005;7:125–133. Abdi F, Quinn JF, Jankovic J, et al. Detection of biomarkers with a multiplex quantitative proteomic platform in cerebrospinal fluid of patients with neurodegenerative disorders. J Alzheimer Dis 2006;9:293–348. Mahley RW, Rall SC Jr. Apolipoprotein E: far more than a lipid transport protein. Annu Rev Genomics Hum Genet 2000;1:507–537. Galasko D. Biomarkers for Alzheimer's disease–clinical needs and application. J Alzheimer Dis 2005;8:339–346. Blennow K, Hampel H. CSF markers for incipient Alzheimer's disease. Lancet Neurol 2003;2:605–613. Thal LJ, Kantarci K, Reiman EM, et al. The role of biomarkers in clinical trials for Alzheimer disease. Alzheimer Dis Assoc Disord 2006;20:6–15. Katzman R. Editorial: The prevalence and malignancy of Alzheimer disease. A major killer. Arch Neurol 1976;33:217–218. Clark C, Xie S, Chittams J, et al. Cerebrospinal fluid tau and β-amyloid: how well do these biomarkers reflect autopsy-confirmed dementia diagnoses? Arch Neurol 2003;60:1696–1702. Maddalena A, Papassotiropoulos A, Muller-Tillmanns B, et al. Biochemical diagnosis of Alzheimer disease by measuring the cerebrospinal fluid ratio of phosphorylated tau protein to β-amyloid peptide42. Arch Neurol 2003;60:1202–1206. Hu YY, He SS, Wang X, et al. Levels of nonphosphorylated and phosphorylated tau in cerebrospinal fluid of Alzheimer's disease patients: an ultrasensitive bienzyme-substrate-recycle enzyme-linked immunosorbent assay. Am J Pathol 2002;160:1269–1278. Hampel H, Buerger K, Kohnken R, et al. Tracking of Alzheimer's disease progression with cerebrospinal fluid tau protein phosphorylated at threonine 231. Ann Neurol 2001;49:545–546. Ishiguro K, Ohno H, Arai H, et al. Phosphorylated tau in human cerebrospinal fluid is a diagnostic marker for Alzheimer's disease. Neurosci Lett 1999;270:91–94. Kohnken R, Buerger K, Zinkowski R, et al. Detection of tau phosphorylated at threonine 231 in cerebrospinal fluid of Alzheimer's disease patients. Neurosci Lett 2000;287:187–190. Vanmechelen E, Vanderstichele H, Davidsson P, et al. Quantification of tau phosphorylated at threonine 181 in human cerebrospinal fluid: a sandwich ELISA with a synthetic phosphopeptide for standardization. Neurosci Lett 2000;285:49–52. Hampel H, Teipel SJ. Total and phosphorylated tau proteins: evaluation as core biomarker candidates in frontotemporal dementia. Dement Geriatr Cogn Disord 2004;17:350–354. Maccioni RB, Lavados M, Guillon M, et al. Anomalously phosphorylated tau and Aβ fragments in the CSF correlates with cognitive impairment in MCI subjects. Neurobiol Aging 2006;27:237–244. de Leon MJ, Klunk W. Biomarkers for the early diagnosis of Alzheimer's disease. Lancet Neurol 2006;5:198–199. Buerger K, Ewers M, Andreasen N, et al. Phosphorylated tau predicts rate of cognitive decline in MCI subjects: a comparative CSF study. Neurology 2005;65:1502–1503. Hansson O, Zetterberg H, Buchhave P, Londos E, Blennow K, Minthon L. Association between CSF biomarkers and incipient Alzheimer's disease in patients with mild cognitive impairment: a follow-up study. Lancet Neurol 2006;5:228–234.